I've spent a bit of time recently turning bowls out of Ash for the first time. As a hobbyist greenwood worker sourcing the raw materials feels a bit like hunting and a bit like scavenging, looking around for a chance to grab some decent wood. This Ash came from the all too familiar sight of a closed down pub. I've never drank alcohol (for religious reasons), but that has never stopped me from going to the pub to socialise with my friends that do. I think that it's a real shame to see so many of our pubs being closed down, partly because I think that they're a part of our culture and partly because it can lead to people drinking at home to a greater excess as it's so much cheaper. Binge drinking I think it's called. Anyway, this was a particularly rough pub, so ignore everything I just said. 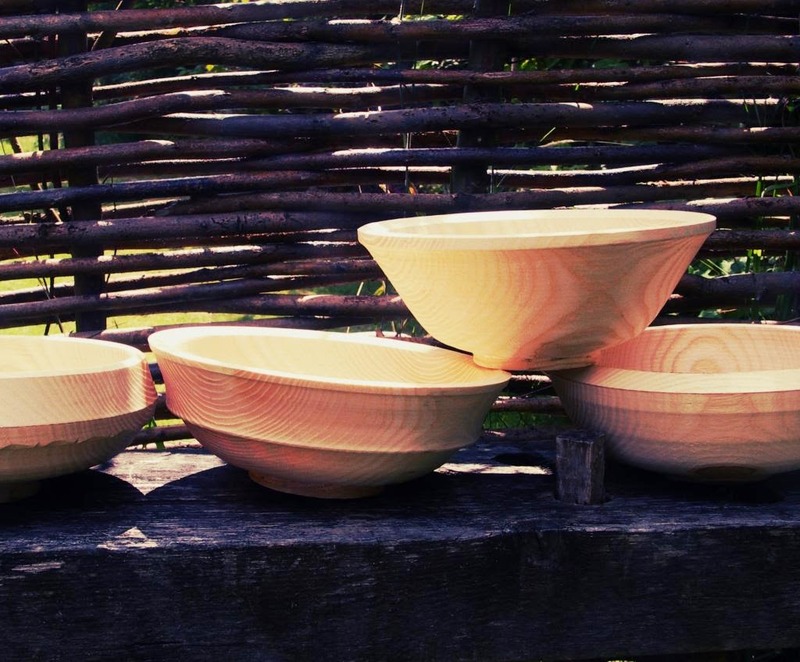 In his fabulous book about wooden bowls, imaginatively titled 'The Wooden Bowl', Robin Wood states that Ash was the most popular wood for bowls from the 12th to the 15th centuries despite the fact that, by his reckoning, it takes nearly half as long again to make a bowl from Ash as it's hard to get a clean cut. Robin was talking about turning on a pole lathe though and as my lathe is electric I didn't think that I would have the same difficulty. I was wrong. The fibrous wood is hard to cut cleanly, even when you crank the speed up a gear. I only tried to apply carved decoration once as well (I don't know how Richard manages to carve so many spoons with it). The distinct grain is lovely though and I'm faced with a real dilemma as to whether I should paint them or not. I have to confess that for a time I was tempted by the sanding demon perched on my shoulder, but I overcame. I got a little bit carried away with this last one and nearly went too far when hollowing it. I might sell it as a special bowl for viewing a solar eclipse. So, not my favourite timber so far, but I have a couple more logs left and until I can hunt down some better wood, I'd better get my Ash into gear. The most boring video ever.